Our local USGBC communities host events all over the country, but we know that we have three very large events each year. GreenerBuilder, Impact and Rocky Mountain Green are our highest-profile USGBC community events. 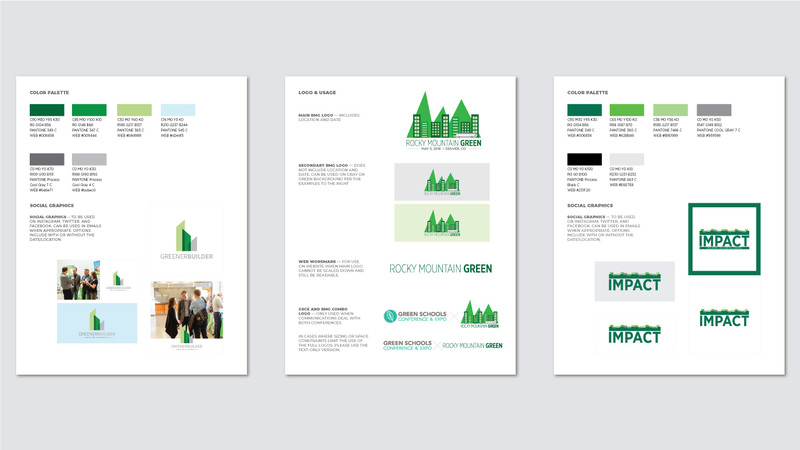 Our marketing team decided that creating short style guides for these three events could help direct the development of assets such as the website, signage, on-site materials and other collateral. We wanted these events to have some cohesiveness across the board, to give them their own look and feel apart from our other national and international USGBC events. For example, we included color swatches to direct the look and feel, as well as guidance about which logo lockups are appropriate for web and print use. There is a section that suggests photography—this is meant to be general support, so community staff know what to look for from their photo banks or stock resources. Another element we like to focus on is social media graphics. Since these events are high-profile for our communities, we want them to be able to promote the events on social media, when appropriate. We usually generate a handful of graphics and guidance about which platforms to share on. We also provide some presentation slide templates and examples. Given that each event will always have presentations, we want to equip the community with all the tools they will need to create a cohesive event. While each community event has its own style guide, we designed these as a cohesive trio of suggestions to ensure these events felt connected. 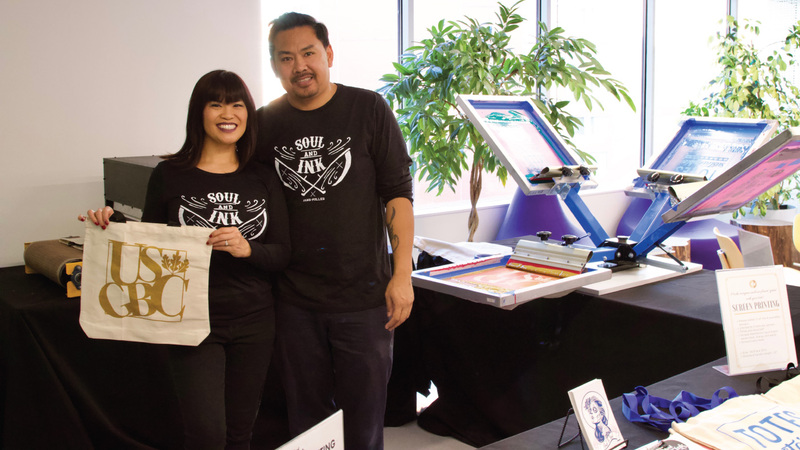 For the USGBC office holiday party in 2017, we booked a screen printer to be live on-site printing tote bags for staff. To go along with that, the events team needed the design team to create the designs for printing. We wanted to keep these playful and fun, and brainstormed some cute phrases related to our green building mission to use in our designs. 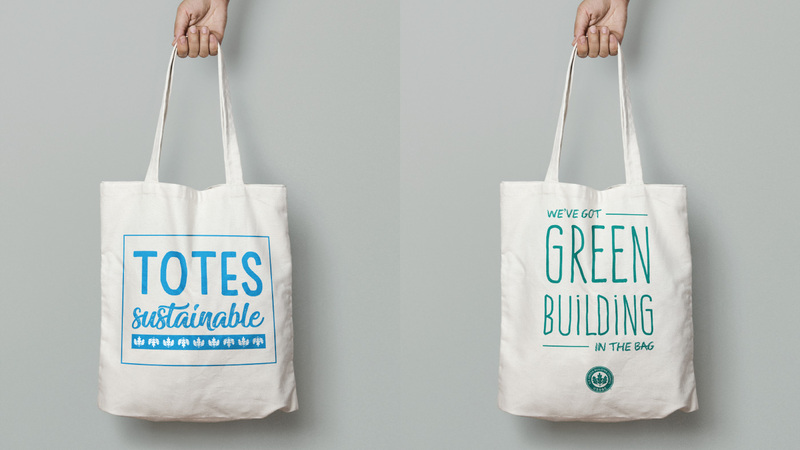 We went with “totes sustainable” and “we’ve got green building in the bag” on two of our designs. Our entire creative team played a part in this project, and all three of our designers contributed final designs. We were able to select the ink color used for printing, and then the screen printers took it from there! They were on-site all afternoon and able to print the totes right there for staff at the party. This was a really fun project to see come to life—a different take on branding and a nice way to take our mission in a playful direction. If you have a party, fundraiser, or team-building event coming up, think about doing a custom project like this to give attendees something cool to take home. Also, the bonus: reusable tote bags for everyone! View the entire project. Every year, USGBC and GBCI highlight the U.S. states that are leading the way with LEED certification. By looking at regional census data, we determine the top 10 states for LEED green building per capita. Our marketing team then produces an infographic to illustrate the number of projects certified and the millions of square feet certified the previous year, as well as the LEED-certified gross square feet per capita. This gives us the bigger picture on how different states are performing year by year. Did your state make the top 10 list for 2017? How about in 2016? We create these infographics to recognize achievements in LEED around the country and to show how the Top 10 States are setting a high bar for excellence in green building. Through social media, presentations and media outreach, the infographic helps to tell their stories and share their success with their communities. 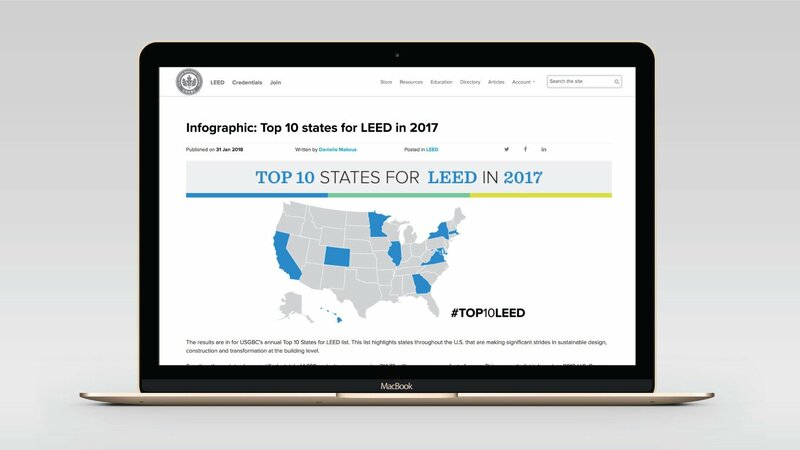 For more details on the Top 10 States for LEED in 2017, read our press release.